The much anticipated release of Monte Serenos Compound homes is finally here! 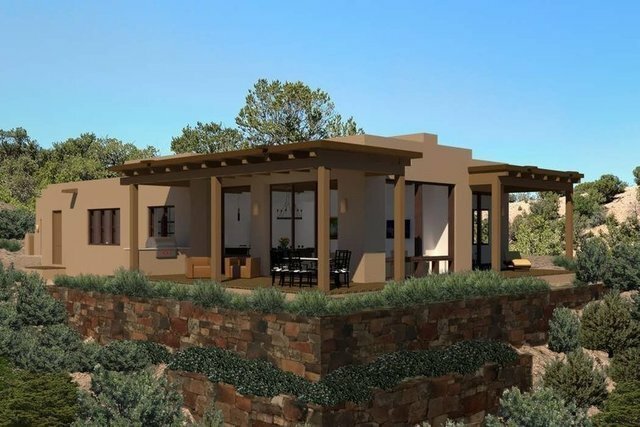 Years in the planning, these exquisite one-level homes feature spectacular views of the Sangre de Cristo mountains in a true lock and leave gated setting. With 2 models to choose from, the developer has christened Santa Fe Soft Contemporary as the theme - with floor plans that match todays relaxed lifestyle. The main living room/dining room space is open to the views with 3 panel sliding glass doors facing the huge East views...and are also open to a gourmet kitchen - featuring Wolf/Subzero appliance package, custom-cabinets, and a large island/casual counter design which affords multiple dining and living options with Mountain Views as the backdrop. Private Master Suite shares the views through the large east-facing portal, and features a corner kiva fireplace. True plaster walls, oak hardwood floors, and high ceilings with square cut beams all accent the contemporary finishes. All of the floor plans are customizable with exciting expansion and upgrade options.